Waterproof Pillow Protectors Washable 100% Cotton. 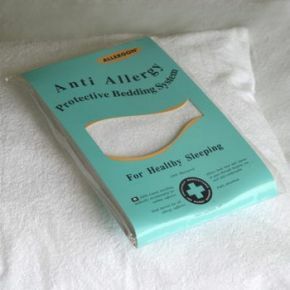 The Allergon Zipped waterproof pillow protector fits standard 470mm x 730mm pillow. It protects your pillow from stains and marks and protects you from contact with dust mites. Machine washable 100% cotton terry outer layer laminated to a microlight waterproof polyurethane membrane. These are nice not scratchy cheap but good soft quality.